Manchester United manager Jose Mourinho has explained why he’s changed his midfield for the Burnley game this afternoon. 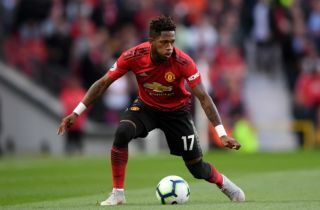 One of the notable calls made by the Portuguese today is that summer signing Fred is out of the starting XI and onto the bench for the first time this season. In his place is Marouane Fellaini, who is not exactly every United fan’s cup of tea, though he of course has his purposes as a squad player. Mourinho believes the Belgian could have an important role to play today due to his height and physicality and because of the way Sean Dyche’s side like to play. United look in dire need of a result today, so fans will hope this proves the right call from their manager, though one can also imagine it’s not ideal to see an expensive summer purchase dropped already. Fred has perhaps looked a little slow to settle at Old Trafford, having started in all three of their Premier League games prior to today. However, with the Red Devils losing two of those, it does seem clear some change was needed this afternoon. Mourinho on Burnley: "They are physical, they are direct. They go very direct to the box, they try to create crossing situations, they try to have lots of set pieces. They are very pragmatic & we thought that we need a little bit of Marouane physicality for that"